This site references the historic Grand Street trolley line that once ran through this area. In May 1894, the first ever Brooklyn City trolley car entered Queens County. At the end of the month, the Grand Street line was opened, running between the Maspeth Depot and Broadway. The line was soon extended to Junction Avenue and across to Bowery Bay. The opening of the line was a ceremonious event during which the first trolley car to travel the line carried a roster of distinguished passengers that included the president of the Brooklyn Heights Rail Road. When the car reached Jackson’s Mill during the opening run, the passengers stopped to tour the old mill whose water wheel and grinding stones were then still intact. The neighborhood of Jackson Heights, through which the line ran, has inadvertently preserved a rich history of the trolley lines. During the 1920s and 1930s, developers built up streets on both sides of Bowery Bay Road. Since the Brooklyn City Rail Road did not want to negotiate a new franchise, it kept the line as it was, and residents became used to trolley traffic rolling behind their houses. In the 1930s, the other parcels of Old Bowery Bay Road were eliminated, so the trolley tracks were the only testament to old street configurations. A decade later, the city paved over much of the line, transforming the stretch into a street. However, one can still find spots of exposed trolley tracks and original bricks where the pavement has worn away, thus affording a glimpse of 1890s Queens. Jackson Heights is a northwestern Queens neighborhood which was originally farmland, but became densely populated after the Queensboro Bridge opened in 1909. The area was home to the nation’s first garden and co-operative apartments, and both types of housing remain dominant in the area today. Jackson Heights was named for John C. Jackson (1809-1889), the former president of the Hunter’s Point, Newtown and Flushing Turnpike Company. In the early 1860s, the company built Jackson Avenue, which ran through the neighborhood. Part of Jackson Avenue was renamed Northern Boulevard on April 22, 1922 by local law. Trolley Car Triangle, bounded by Astoria Boulevard and 97th Street, was developed as a park in 1927. The City acquired the property in September 1928 by condemnation, and Parks immediately gained jurisdiction. The park was originally known as Street Car Triangle, again for the old trolley line, but Parks Commissioner Stern renamed the property Trolley Car Triangle in 1997. The triangle underwent reconstruction in 2001, thanks to a nearly $25,000 allocation from Mayor Giuliani. The reconstruction project rebuilt the park’s sidewalks. 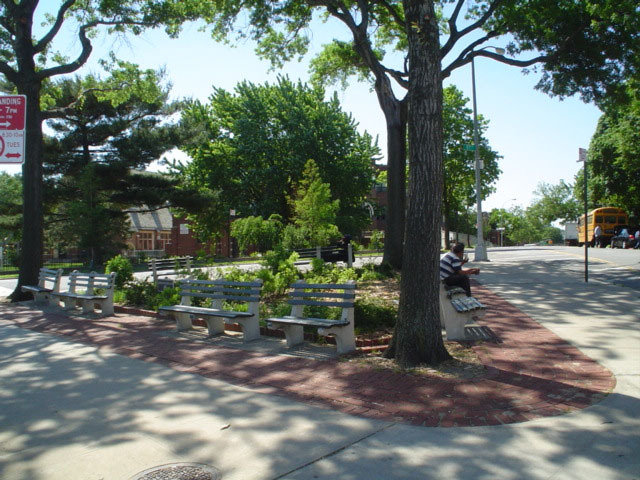 In the park are several benches, shrubs, and plants, and pin oak trees (Quercus palustris).